With the addition of new technologies, conference calls are becoming outdated and have sometimes been the cause of employees or clients missing pertinent information during the call. However, with the addition of all these new technologies comes one technology that will do away with teleconferencing and allow offices to play a more collaborative role. 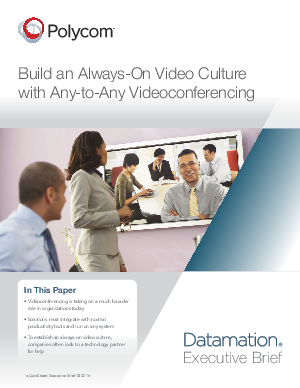 Download this whitepaper to learn how to create an always-on video culture for your organization and see how your business can benefit from the addition of any-to-any videoconferencing.